Posted by t-maker in History, Miscellaneous. 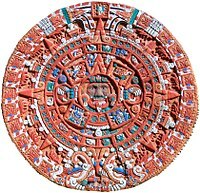 When reading “The Ancient Sun Kingdoms of the Americans” by Victor Wolfgang Von Hagen I’ve discovered that right now (03/05/2009), according to the aztec calendar, it is the month called Tlacaxipehualiztli that means flaying of men. I think the Aztec Calendar System deserves attention. It can be briefly summarized in the following way. II. feb 22 – mar 13 Tlacaxipehualiztli (flaying of men) The priests danced wearing the skins of the flayed victims. III. mar 14 – apr 02 Tozoztontli (little vigil) Fasting. Then another holiday with the priests danced wearing the skins of the flayed victims. Sacrifices of children calling forth a rain. IV. apr 03 – apr 22 Hueytozoztli (great vigil) Blessing of new corn. Sacrifice of a maid, of boy and girl. V. apr 23 – may 12 Toxcatl (dryness) Sacrifices of children thanking gods for a rain. VI. may 13 – jun 01 Etzalcualiztli (meal of maize & beans) Impersonators of water deities sacrificed by drowning and extraction of the heart. VII. jun 02 – jun 21 Tecuilhuitontli (small feast of the lords) Impersonators of the gods sacrificed. Sacrifice by extraction of the heart. VIII. jun 22 – jul 11 Hueytecuihutli (great feast of the lords) Feast for goddess of young corn. Sacrifice of a woman impersonating the goddess. IX. jul 12 – jul 31 Tlaxochimaco (birth of flowers) All the gods festooned with garlands. Sacrifice by starvation in a cave or temple. X. aug01 – aug 20 Xocotlhuetzin (fall of fruit) Hueymiccaihuitl (great feast of the dead) Ceremonial pole climbing competition. Sacrifice to fire gods by roasting victims alive. XI. aug 21 – sept 09 Ochpaniztli (sweeping of the roads) Sacrifice of a decapitated young woman to goddess Toci. She was skinned and a young man wore her skin. Sacrifice of captives by hurling from a height and extraction of the heart. Fights of gladiators. XII. sept10 – sept 29 Teoleco (return of the gods) Ceremonies welcoming gods returning to earth. Ceremonial drunkenness. Sacrifices by fire. XIII. sept 30 – oct 19 Tepeihuitl (feast of the hills) Ceremonies for mountain rain gods. Human sacrifices and ceremonial cannibalism. XIV. oct 20 – nov 8 Quecholli (precious feather) Ritualistic hunt following fast. Sacrifice by bludgeoning, decapitation and extraction of the heart. XV. nov 09 – nov 28 Panquetzaliztli (raising of the banner) Homes and fruit trees decorated with paper banners. Massive sacrifices of captives and slaves by extraction of the heart. XVI. nov 29 – dec 18 Atemoztli (water decends) Festival honoring water gods. Children and slaves sacrificed. XVII. dec 19 – jan 07 Tititl (stretching) Sympathetic magic to bring rain. Women beaten with straw-filled bags to make them cry. Sacrifice of a woman by extraction of the heart and decapitated afterwards. XVIII. jan 08 – jan 27 Izcalli (resuscitation) Image of god made from amaranth dough. Feasting on tamales stuffed with greens. jan 28 – feb 01 Nemontemi (empty days) Five unlucky days. No rituals, general fasting. The correspondence with Julian months is given according to Bernardino de Sahagún. The solar year consisted of 360 named days and 5 nameless (nemontemi). The year was broken into 18 periods of twenty days each (months). It’s hard to preserve the belief in humanity reading all this madness.